This informative, concise, and timely quarterly magazine is made for YOU the rural landowner, or backyard enthusiast. Choose the right pesticide, apply correctly for range and croplandsWildfire has rolled through, what do you do now? 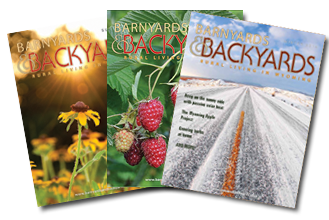 Subscribe to Barnyards and Backyards - For questions about subscribing to Barnyards & Backyards, contact us at (307) 766-2115. If your question is used in the "Ask Sam" feature, you will receive 1 year subscription free!